Has your electrical system been inspected and found to have code violations in your Athens home? Living in an environment with electrical code violations poses safety risks for your entire family. The reasons these codes are implemented is to make sure circuits are not overloaded and wiring is safe, in order to prevent electrical fires. Meehan Electrical Services has served as an Athens electrical code expert for more than 59 years. If you've got an electrical code violation "to do" list that you're not sure what to do with, simply call (706) 717-4947. There are a variety of common code violations frequently found in homes across the state. The violations listed below must be corrected quickly both for the safety of residents and legal reasons. Meehan Electrical Services's top priority is to keep you and your family safe from the dangers of electrical violations in your Athens home. Damaged and Outdated Wires: Not only do they keep your appliances from functioning properly, cracked or loose writing can cause damage to your outlets and appliances and can cause electrical shocks or fires. Weak Electrical Connections: Lights and power will flicker and then become overload if connections are poor. This may result in damage to appliances and lighting. We'll tighten all connections. Incorrect Outlet Usage in Athens: GFCI outlets must be used where water is present, including kitchens, bathrooms and pool areas. Using incorrect outlets when water is present is extremely dangerous. Faulty Panels: Breaker panels serve as the home base for your home's electrical system. If your breaker panel is not strong enough to handle all of your electrical needs, or if it is wired improperly, all other electrical connections in your home are affected. Incorrect or Inadequate Installations: If you have purchased a home from someone who tried to do their own repairs, or if you are a fan of electrical DIY, your outlets may be incorrectly wired, or installed at the wrong height, or there may not be enough outlets for a given space. Call (706) 717-4947 to make corrections on outlet installations. The electricians at Meehan Electrical Services are experts in correcting dangerous electrical code violations in Athens inexpensively, quickly and safely. Call (706) 717-4947 for a free estimate and ask us to review your electrical inspection. We'll check each one off efficiently and at fair pricing. 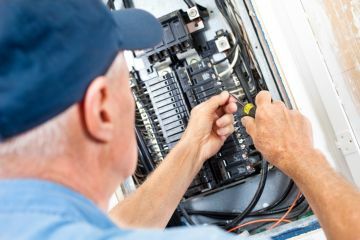 Our electrical technicians are fully licensed and certified to complete all necessary electrical repairs in Athens, Georgia. What's more, our whole team frequently undergoes additional training sessions to further our education and provide the most comprehensive Athens electrician service available. Call Meehan Electrical Services today for a free written estimate for repairs.